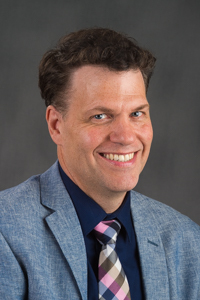 BLOOMINGTON, Ill.— Illinois Wesleyan University Associate Professor of French and Italian Scott Sheridan recently translated The Guardians of History (AmazonCrossing, 2015), a bestseller by Italian author Elisabetta Cametti. This is the second novel that Sheridan has translated for AmazonCrossing, the largest publisher of its kind for translated works. “Based on my previous experience and reputation, I was selected by the publisher to translate this book,” Sheridan said. “It was important that they chose a reputable translator who could give them a quality finished product suitable for the popular fiction market,” because of the significant financial investment involved for the company. “The experience has been amazing since it allows me to continue to practice my language skills while knowing that the audience that reads my translated work is considerably large,” he said. Sheridan also expressed excitement about his collaboration with the author Cametti during the process of translating The Guardians of History. Sheridan also serves as director of International Studies at IWU. He earned a Ph.D. in French literature from the University of Iowa.